It’s just before 9 a.m. on an overcast February morning. About 60 fifth graders at a Harlem charter school have just filed into a multipurpose room to hear architect Phil Freelon talk about his career-defining work on the National Museum of African American History and Culture, or NMAAHC, in Washington, D.C., the universally celebrated newest addition to the Smithsonian Institution. But before he gets to his lesson about the design—a brilliant, bronze-hued building that alights the Mall like a shining crown—he warms up the crowd by letting them in on a secret: He once played drums in a band with his brother, Gregory Freelon, a teacher at the school. The room’s energy perks up as students whisper; Phil has instantly connected to each of them. Now it’s time for the meatier part of his talk. “What does art mean to you?” he asks. Eager hands shoot into the air. “Art is a subject of creativity,” a boy says. “It’s expressing yourself,” a girl comments. Freelon gestures toward the room’s vibrant student paintings and explains that while art can hang on a wall, it can also have dimension, like a sculpture. Or even a building. He’s made the link to architecture. Now they’re hungry for more. After speaking about the NMAAHC’s influences–how the crown on a traditional African column influenced the structure’s shape, how the latticed facade riffs on cast-iron fences in the American South that were often built by slaves, and how the building’s angles are exactly the same as the Washington Monument’s peak–Freelon welcomes questions from the students. But in addition to designing spaces that celebrate diversity, Freelon is trying to design diversity and inclusivity into the very profession of architecture–which is stubbornly male and pale. According to a 2017 report from the National Council of Architectural Registration Boards, 90% of architects identified as white, 5% as Asian, 2% as African American, and 2% as other. Only 19% are female. The percentage of African-American architects has remained steady at 2% for the last several years. It’s why Freelon is visiting a school where 100% of the students are from low-income and/or minority families to talk about his work; why, earlier that same week, he spoke to his grandson’s second-grade class. By getting children interested in architecture at an early age, Freelon hopes to infuse his profession with a wealth of perspectives and voices. Freelon, who is 65, speaks softly with a slight southern twang. He’s got the demeanor of a professor, and, with his charcoal-gray suits and black sneakers, the look of an architect on the go. There’s an economy to his words—a reflection of his design sensibility, which derives its richness from having only the essential details and right references to make a building understandable and meaningful. Freelon is trying to shift those winds, and promote diversity and inclusion through a multi-pronged approach. Earlier this year, the AIA issued new guidelines for equity, diversity, and inclusion, and many of its suggestions mirror the strategy Freelon has taken for years: better K-12 education outreach, financial aid for university students, and more aggressive hiring. He speaks to students of all ages about architecture, and gives speeches and appears on panels. In 2016, he and Perkins + Will established the Freelon Fellowship at the Harvard Graduate School of Design, a financial aid program for students from underrepresented demographic and economic backgrounds, which named its first fellow, Aria Griffin, this fall. But most importantly, he’s leading by example by structuring his practice to be as inclusive and diverse as he would like to see the overall profession become. His practice is about 40% women and 30% people of color. The managing director of Freelon’s practice, Zena Howard, is an African-American woman and has been working alongside him for 14 years. Freelon tells me this during a February meeting at his then office in North Carolina’s Research Triangle Park, a suburban innovation hub. Freelon has worked out of this area since 1990, when he founded his own firm, the Freelon Group, which merged with Perkins + Will in 2014. It’s an understated building with glass walls, views of the surrounding trees, concrete floors, and exposed steel trusses. Dozens of study models line bookshelves in the cavernous space; plans for in-progress projects are tacked up on the walls, and a tidy library of material samples tucked in the back. His is the only private office in the building, an unfussy room strewn with papers, books, and magazines. He has a few antiques from his travels to Africa and South America perched on a long, low shelf and access passes to the Grammys propped up on a windowsill from when he was a guest of his wife, the jazz singer Nnenna Freelon, who is a six-time nominee of the award. In early 2016, Freelon was diagnosed with ALS, a progressive neurodegenerative disease, and the diagnosis has thrown his impact on the profession–and the designers around him–into sharper relief. At a time when both citizens and organizations are waking up to the inequities that hamper social progress and the realization of great ideas, his career is a blueprint for making an industry more diverse and empowering people and others to effect change through creative work. His legacy isn’t just about designing buildings–it’s about building people. Freelon was born and raised in Philadelphia and his family–which included artists and educators–fueled his creativity and his social perspective. His father, a sales and marketing professional, and mother, a school teacher and administrator, encouraged Freelon and his siblings to pursue what they were interested in creatively. Freelon and his brother used to build toy models their father bought for them on business trips. It’s impossible to visit Durham and not encounter Freelon’s work. Historically, the city’s economy was based on manufacturing and Durham, in comparison to Raleigh and Chapel Hill, is known as the blue-collar town in North Carolina’s triangle. For generations following the Civil War, tobacco and textiles were the city’s primary industries. The city experienced a growth spurt in the first half of the 20th century, and many of its downtown buildings—including the one where Freelon and his wife resided for decades—were constructed during the Art Deco era. The city has been a hub of African-American entrepreneurship for decades (which grew from the Jim Crow laws in the United States, which forced African Americans to develop their own companies); downtown Durham was known as Black Wall Street. As the tobacco industry left, and urban renewal planning practices took over in the 1960s and ’70s, the city’s economy slumped. In the last few decades it has experienced a gradual rebirth, much of which is tied to Duke University’s growth and the thriving education and medicine industries. Freelon’s work is primarily in the public realm—a by-product of his interest in architecture that enriches communities—and much of it runs parallel to the region’s upswing. In 1995, the Freelon Group, in collaboration with HOK Sport, completed a $16.1 million stadium for the Durham Bulls, the city’s triple-A minor league baseball team. Located in downtown Durham, the stadium is part of an adaptive reuse project that turned a former tobacco factory into a mixed-use development. In 2008, he completed Durham Station Transportation Center, the city’s public transportation hub, which serves an estimated 4.5 million passengers annually. At the Raleigh-Durham airport, he designed the parking structure, which earned state and local AIA honor awards, and the General Aviation Terminal. Years later, his firm collaborated with architect Curt Fentress on Terminal 2–a 920,000-square-foot, $570-million structure that opened in 2011. The previous public health department building was a windowless brick fortress–a building that was harsh and imposing with little interest in quality of life for the people who worked there or who came for services. Freelon’s design, on the other hand, puts human experience at the center. Completed in 2013, DCHS is home to public medical, dental, and mental-health services. The airy, energy-efficient building is wrapped around a central courtyard, which offers people who use the building a calm area to use while they wait for their appointments, and helps keep daylight enter the sprawling 277,000-square-foot structure. While Freelon is widely respected among peers, what he’s recognized for most from the public is advancing diversity through museums and cultural centers dedicated to African-American history. Freelon’s success in this area is a function of his strength as a designer and communicator—but it’s also the result of shrewd business development by one of his closest colleagues and oldest friends, Lew Meyers. Meyers has known Freelon for over 30 years, and Nnenna since she was in high school when he was her Upward Bound counselor. He started with the Freelon Group in 1997 as a business development consultant and later joined the firm full-time to become the head of marketing (and a shareholder). His role was bringing in new clients and projects, generating exposure for the firm, and talking up Freelon’s bona fides. He became Freelon’s right hand over the years; if they were a double act, he’d be the funny man to Freelon’s straight man. After retiring in early 2016, Meyers joined Downtown Durham Inc.—an economic development nonprofit—as its interim CEO. To Meyers, how people network is one of the biggest challenges of making the profession more diverse. It’s a problem present in many industries, but it’s especially prevalent in architecture–and the business of architecture–since commissions are frequently based on reputation, word of mouth, and connections. During lean times economically, a substantial part of Meyers’s role was staying active in community groups, attending conferences, and keeping his ear to the ground to stay abreast of potential commissions so that when a big project did come about, the people commissioning the building would immediately think of Freelon’s firm. Meyers’s networking strategy fueled the firm’s rise in the cultural realm. In the early 2000s, he attended a conference hosted by the American Alliance of Museums, a nonprofit professional association for the museum industry. At the conference, the Association of African-American Museums hosted a reception for their annual meeting, which was done on a nonprofit’s budget, to put it gently. With that offer, the Freelon Group became a sponsor of the Association of African-American Museums. “We hit that market at the right time in the sense that, why was there a proliferation of African-American museums? Because people of color were getting on city councils, and they said it’s my time,” Meyers says. It was at one of those receptions that he met someone working on the Museum of the African Diaspora (MoAD), in San Francisco. Freelon eventually won the commission in 2002. At the time, there were few nationally recognized museums focused on African-American history and the Freelon Group was completing two of them: MoAD and the Reginald F. Lewis Museum, in Baltimore. Meyers enlisted the help of an outside publicist, Michael Reilly, and the two, recognizing that it was a category of museum that was poised for growth, orchestrated a large press push and got the coverage and national media attention they wanted for the firm’s work on both museums. The Lewis Museum is located in downtown Baltimore, a short walk from the city’s waterfront. It celebrates the achievements of Maryland’s African-American citizens, and also tells their painful history. The museum’s design embodies this duality. The facade is mostly somber black granite, except for a zip of red and a yellow wall near the museum’s entrance. Inside, a vibrant vermillion interior wall becomes a multi-story sculptural feature that wraps around a dramatic staircase. For MoAD, which opened in 2005, Freelon and his team were presented with a challenging but prominent site in an area of San Francisco’s South of Market neighborhood that’s become a mini cultural district. The architects called for an all-glass facade so that passersby can see the three-story tall mosaic mural of a young child’s face, which is composed of hundreds of photographs—a metaphor for the museum’s mission of highlighting the stories of different individuals and groups that are part of the larger diaspora. After the museum opened, it was covered locally in the San Francisco Chronicle and nationally in the New York Times. Because museums are big-budget projects, the boards commissioning them often go to architects who have shown that they’re able to work successfully at that scale. With two under his belt, Freelon was automatically on the radar of anyone else who was considering one. In 2007, Freelon won his next big commission, the Harvey B. Gantt Center for African-American Arts and Culture, in Charlotte, North Carolina. The 43,000-square-foot museum’s tessellated exterior walls nod to West African textiles and the patterns from quilts sewn during the Underground Railroad’s era. Freelon helped convince the museum’s board to site the building in the central business district, a part of the city that was once the heart of the black community but was razed in the 1960s for urban renewal plans. This decision reinserts lost culture into downtown Charlotte and makes the museum’s subject matter more accessible to all of the city’s residents. The wins kept coming. In 2009, the Freelon Group won a competition to design the National Center for Civil and Human Rights (CCHR), in Atlanta, beating out higher profile competitors like Diller Scofidio + Renfro and Antoine Predock. “Phil will often speak about bringing high-quality design to groups or communities that can’t normally afford high-quality design–they sort of get the leftovers,” says Kenneth Luker, a design principal at Perkins + Will’s North Carolina Practice who has been working with Freelon for 11 years and was a lead designer, under Freelon’s direction, of the CCHR. The museum’s form—two arcs that embrace a central volume—was inspired by the symbolism of interlocking arms in an iconic photo of Martin Luther King’s 1965 Alabama march from Selma to Montgomery. Designed to be a space for action, the CCHR’s site was inspired by great urban gathering areas, like Tiananmen Square, Tahrir Square, and the National Mall. To Luker, the significance of Freelon’s work was made more apparent through the Black Lives Matter movement and in the weeks and months following the 2016 election. His buildings–like the National Museum of African American History and Culture and the National Center for Civil and Human Rights–were hubs for political demonstrations and helped enable action. 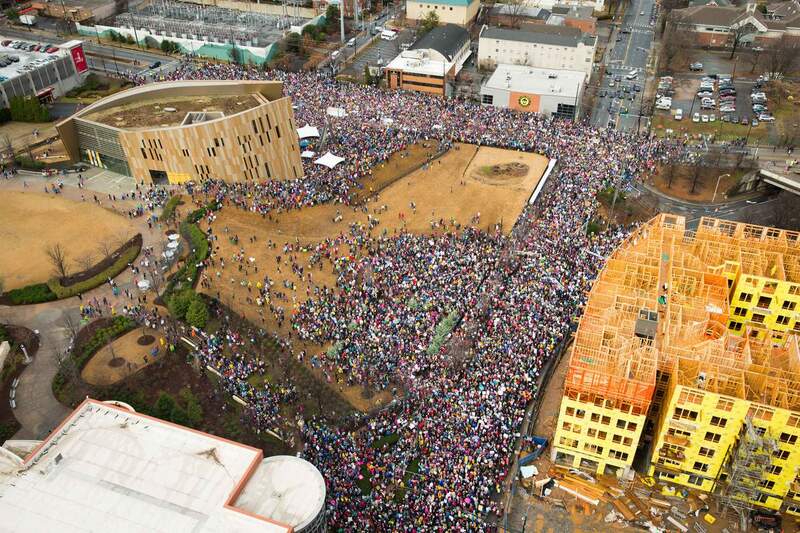 Many protests began or ended at these locations and aerial photography of the demonstrations showed thousands of people congregating around them. “They very clearly mattered at that moment and you understood the impact and the meaning that they had to the community,” Luker says. The connection communities develop to Freelon’s building is by design. A building that speaks to the people who use it, his philosophy goes, will ultimately work better for them and stand the test of time. He uses stories to ground each work: the symbolism of MLK in the CCHR’s silhouette, the reinterpretation of slave quilts for the Gantt Center’s façade, and the nod to African crowns in the Smithsonian’s form. Even if you don’t step inside one of these buildings to see the exhibitions that explain the narrative they physically represent, they become part of public’s collective experience. Freelon also uses this storytelling approach in the public spaces he designs. Take his recent renovation of Emancipation Park, an 11.5-acre public space in Houston, Texas’s Third Ward, an historically African-American, underserved neighborhood. In 1872, local church groups led by a minister who was a former slave pooled together $800 to purchase the land and named it Emancipation Park to honor their newfound freedom. Due to segregation laws in the city, it was the only public park accessible to African Americans for decades. Until the 1960s, it had the only pool for African Americans. After Houston awarded Freelon and his firm the $33 million renovation, but before any design work took place, he spent an entire year hosting workshops and informal get togethers like BBQs to hear what the community wanted the new park to embody. Lifelong residents in the area shared their personal stories about their connection to the neighborhood and park. As an especially meaningful and symbolic space, Freelon knew their input would be crucial for the project’s success. The project includes renovated fields, a new pool, and a new community center whose footprint is inspired by shotgun houses in the area. The flexible design can accommodate new uses over time, ensuring that the park can evolve along with the community. The sensitivity Freelon and his team showed on Emancipation Park represents the design approach they take for every project the practice takes on. Architecture is an industry where egos run rampant and the visionary genius is often lionized, but Freelon takes a more empathic and democratic approach. He takes his role as a mentor–to his staff, to his students, and to aspiring architects–very seriously, as it directly relates to the diversity pipeline problem. As a rule, every time a parent cold-calls his office and says their son or daughter is interested in architecture and wants to learn more—which happens a few times every year—Freelon always invites them to his office. Either he or someone from the office will show them around and tell them about the work they do, why they pursued the career, and what it means to be an architect. This policy has directly led to getting more underrepresented individuals into the profession. Edwin Harris–who worked on Emancipation Park, Freedom Park, CCHR, and the Smithsonian–was one such individual. He grew up in a rough neighborhood with underfunded schools in Richmond, Virginia. He liked drawing, and his grandfather suggested that he become an architect. Harris didn’t know anything about what the job meant, and he wanted to talk to some practicing architects to learn more. After graduating from architecture school and gaining some professional experience at firms in the Raleigh-Durham area, Harris returned to Freelon to talk about a position at the firm. He got the job and worked there for nearly 10 years before launching Evoke Studio in February with Teri Canada and Billy Askey, also a former architect in Freelon’s practice. Harris is now a registered architect, a LEED-accredited professional, and a member of the National Organization of Minority Architects. Canada became familiar with Freelon’s work during architecture school. She met him at a Chamber of Commerce meeting after she had been working for a few years and struck up a conversation about the type of work she was doing and what she hoped to achieve. Freelon invited her to visit his practice and eventually hired her. When she decided to leave Freelon’s practice to launch her own, he encouraged her. Canada worked with Freelon for close to a decade and was appointed to Perkins + Will’s diversity council to help foster more inclusivity, an important part of her professional work. (Canada was one of the first five African-American women to become a registered architect in North Carolina, is a LEED AP, and is also a member of the National Organization of Minority Architects.) At Evoke Studio, she plans to create the same supportive environment she experienced with Freelon. Pierce Freelon, the youngest of Phil’s three children (his daughter, Maya Freelon Asante, is an accomplished visual artist and his other son Deen Freelon is a communications professor), agrees that helping kids uncover their interests early is important. In 2014, he founded Blackspace, a youth education program in Durham and Chapel Hill that teaches digital media, writing, music, and social entrepreneurship. In 2017, he ran for mayor of Durham on a platform of equitable growth, intersectionality, nurturing the city’s youth. Educational outreach and mentoring has been a mainstay in Freelon’s work, but recently he’s become a different type of advocate. After he was diagnosed with ALS in early 2016, he founded the Freelon Foundation to help raise awareness and research funding to help combat the disease. In April, he and his wife, Nnenna, hosted a benefit concert that raised $95,000 for the Duke University ALS Clinic. To date, the Foundation has raised $172,000 for ALS research. Freelon’s diagnosis has accelerated some things that were already in the back of his mind, namely a succession plan for eventual retirement. He stopped teaching in 2016, but remains on the faculty at MIT’s School of Architecture + Planning–he’s become more selective about his speaking engagements and encourages senior members of his team to step up and take his place at the podium. He took a monthlong vacation last year, but when he got back to work, he was more energized than ever. Freelon and his wife have been planning a new home for over a decade. This October, they finally completed it. The North Carolina Practice is in a transitional moment as it readies itself for its next chapter. In mid-May, Freelon stepped down from his position as managing director (Zena Howard earned a promotion to the position), but he’s retaining his position as design director. In August, it relocated to a space in the North Carolina Mutual Building in Downtown Durham, a Brutalist tower which, at its construction in 1965, was the tallest building owned by African Americans, and is located across the street from the Durham Transportation Center. As Freelon’s ALS progresses, it’s likely that he’ll step back from the firm entirely. But because of his leadership and how he’s designed his practice, the hallmarks of what makes his work remarkable will endure indefinitely. In parallel with his prolific career designing buildings, Freelon has designed a network of architects and creative leaders who are actively following his lead—and they are thriving. Perhaps one day, one of the eager fifth graders he spoke to that cloudy February day will be among them.